It’s the little things that make the Fanzo kitchen special. But it’s the big things that make it great! If the devil is in the details, then Pietro and Tina Fanzo’s Mono kitchen is one helluva place. At first glance, it seems like any other beautiful kitchen with its gleaming appliances, ample cupboards and polished floors. But on closer examination, Pietro’s passion for craftsmanship and Tina’s love of design elevate the space to new heights. A printer’s drawer becomes storage for odds and ends. Photo by Pete Paterson. 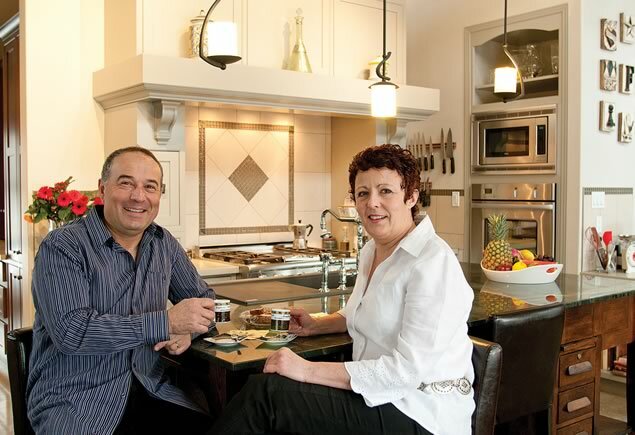 “This kitchen is a labour of love,” says Tina, sipping a single shot of steaming espresso. She pulls out a shallow drawer from under the kitchen island where she is sitting. 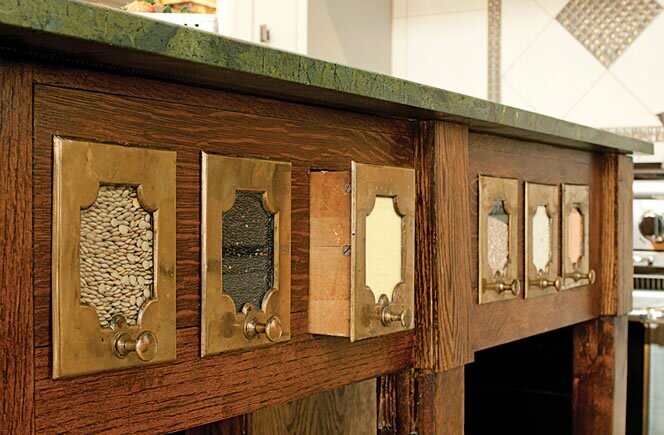 A multitude of tiny slots that once held brass letters is now a repository for everything from twist ties to nuts and bolts. The old printer’s drawer is cleverly embedded in a vintage oak secretary’s desk that forms the base of the large marble-topped island. 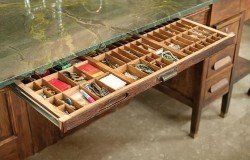 The desk in turn is attached to an antique bar table whose brass-fronted bins provide colourful storage for an assortment of grains and legumes. 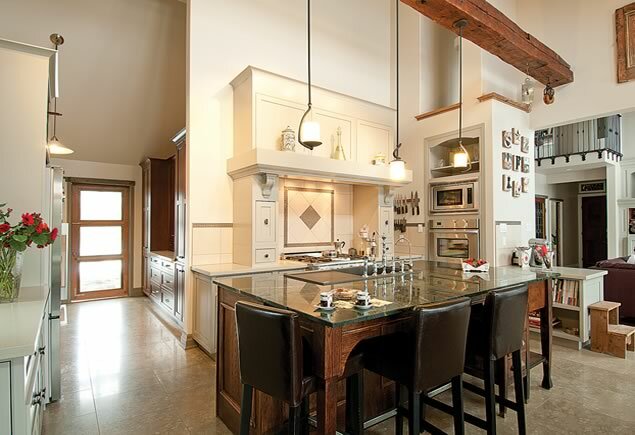 The couple selected the marble island top for its bottomless colour. “We loved the green as soon as we saw it,” says Tina, tracing with her fingertip a dark vein of imperfection that meanders the length of the eight- by four-and-a-half-foot slab like a forest stream. 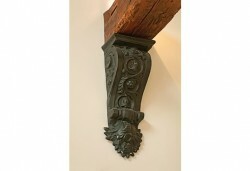 A cast-iron corbel supports an old barn beam. Photo by Pete Paterson. Other eye-catching accents include a cast iron corbel supporting a pine barn beam they found one day in a field, brought home and power-washed, then treated with tung oil. A pair of ornately carved cabinet doors graces the wall overlooking the dining area. An antique pulley hangs from the ceiling. 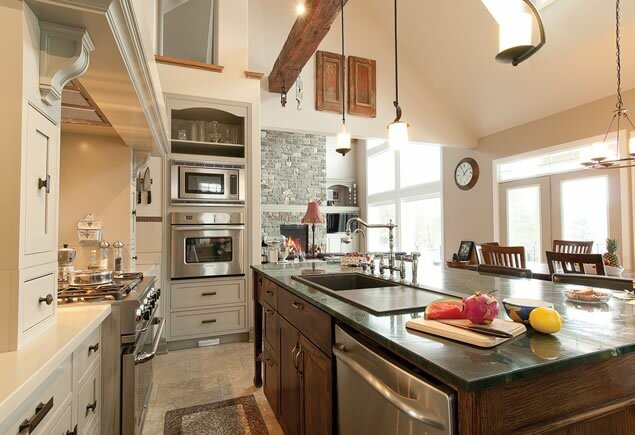 In the prep kitchen/pantry, an old-fashioned, one-piece metal sink and drain board provides space for washing up. “We stripped it down, took off the rust spots and painted it white,” says Pietro. 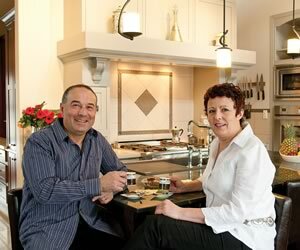 Born in neighbouring villages in Italy, the couple first met in Canada where their love of food and cooking created an instant bond. “We do everything together,” says Pietro, a professional chef and, until recently, owner of the Brampton restaurant Fanzorelli’s. Indeed, dinner parties with family and friends are a favourite activity. On this particular day, they are preparing a simple Italian dinner of spinach egg drop soup, roast chicken and poached pears to serve to a neighbourhood couple. While it’s the loving details that give their kitchen its unique character, it’s the big things that make it a heaven to work in. 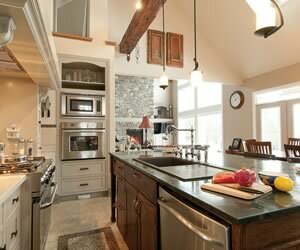 The well equipped working space boasts a two-oven, six-burner propane stove with an open grill. Poached Pears with Blueberry or Chocolate Sauce. Photo by Pete Paterson. “You really want good exhaust when you’re grilling,” says Pietro. So he went all out and had a restaurant-quality hood built in to look like a mantelpiece you might find in a traditional Mediterranean kitchen. “It’s really quiet,” he adds. 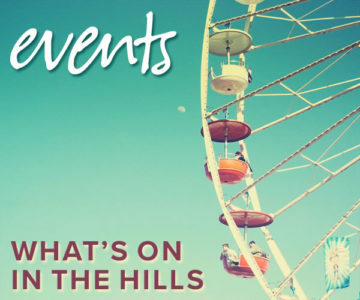 “You’d never know it was there. Look closely at the floor and you can make out tiny fossils embedded in the square limestone tiles, but, says Tina of the mottled stone, “You won’t see any dirt on this floor.” The custom cabinets (with lots of drawers for storing pots and bottles) are by a Quebec company, Cabico. They are painted a soothing Farrow & Ball shade called Hardwick White. The walls are Sherwin Williams’ Balanced Beige and the countertop is Caesar Stone in a smooth creamy Cinder. “There is so much to think about when you’re building a kitchen,” sighs Tina. But get the details right and the result is a chef’s paradise. Pietro and Tina Fanzo bring a taste of Italy to the Mono countryside. Photo by Pete Paterson. 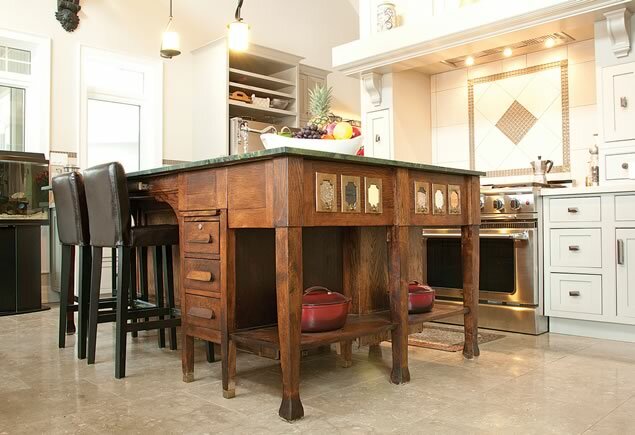 An antique secretary’s desk forms the kitchen island’s base. Photo by Pete Paterson. The pantry doubles as a prep area. Photo by Pete Paterson. High ceilings create an airy atmosphere. Photo by Pete Paterson. Former pony clubber and lifelong horse lover, Cecily Ross is a freelance writer who lives in Creemore. These can be prepared up to two days in advance. 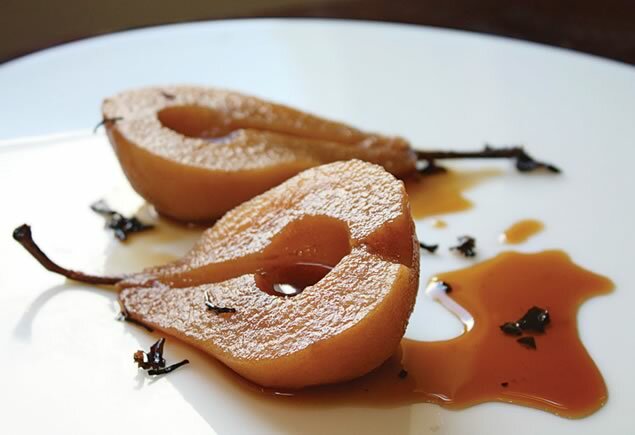 Serve with blueberry syrup or chocolate sauce. A simple Italian dinner of spinach egg drop soup, roast chicken and poached pears prepared by Pietro and Tina Fanzo in their Mono kitchen. Starter for a simple Italian dinner of spinach egg drop soup, roast chicken and poached pears prepared by Pietro and Tina Fanzo in their Mono kitchen.